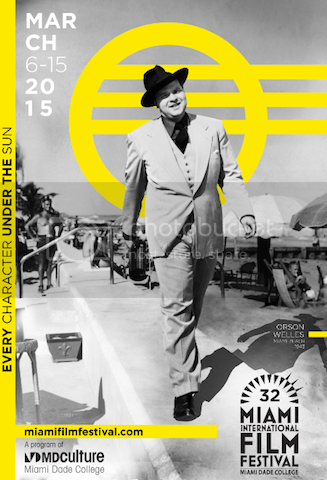 Miami, FL — Miami International Film Festival (MiamiFF), a program of Miami Dade College’s MDCulture, proudly unveiled today the official poster for the 32nd edition, featuring legendary writer, producer and director Orson Welles strolling the Miami Beach boardwalk in 1943. Adding a layer of Welles-ian mystery, the photographer of this remarkable 70-year-old image is unknown. So whodunit? The festival invites the public to help solve this mystery as it gears up for its international film premieres and festival activities taking place March 6 – 15, 2015. The image of Welles walking in Miami Beach is a multi-dimensional thrill-ride of potential descriptors for locals: pride, nostalgia, iconography, legends, celebrities, classics, vintage, and the beauty of our beaches. The Festival’s dynamic (remarkable is repeated too many times) slate of films and distinguished filmmakers featured in the past 32 years illustrates that Miami has long been a mecca for the greatest artists of our time, filing in for inspiration, collaboration and relaxation, following in the footsteps of the giants who have come before. Renewed interest in Welles’ career and remarkable body of work – over an acclaimed theater, television and radio career, plus an unparalleled feature film slate that includes Citizen Kane, The Magnificent Ambersons, Othello, Touch of Evil, The Trial and Chimes of Midnight – has surged of late. In Spring 2015, documentarian Chuck Workman is releasing Magician: The Astonishing Life And Work of Orson Welles, featuring pristine film clips and behind the scenes video of the artist’s entire career. And in May 2015, Welles’s last unfinished film, The Other Side of the Wind, will finally be released after four decades of behind the scenes drama; a film which cinema buffs consider to be the most famous movie never released. A movie within a movie, The Other Side of the Wind chronicles the comeback attempt of an aging maverick director played by John Huston, with a supporting cast including Susan Strasberg, Lilli Palmer, and Dennis Hopper, with Peter Bogdanovich playing an up-and-coming director. While Welles obsessively worked on the film during the last 15 years of his life, successfully assembling 45 minutes of edited work print, original producer Frank Marshall and Peter Bogdanovich will finally finish cutting the film based upon Welles’s own notes, utilizing over 1,000 canisters of impeccably directed film Welles left in Paris before his death in 1985. The blessing for Marshall and Bogdanovich to do so finally earned Welles’ heirs permission when producers successfully argued that the film’s release would properly celebrate the 100-year anniversary of Welles’ birth. Celebrating its 32nd anniversary March 6 – 15, 2015, MiamiFF is considered the preeminent film festival for showcasing Ibero-American cinema in the U.S., and a major launch pad for all international and documentary cinema. The annual Festival, produced and presented by Miami Dade College, attracts more than 60,000 audience members and more than 400 filmmakers, producers, talent and industry professionals. It is the only major festival housed within a college or university. In the last five years, the Festival has screened films from more than 60 countries, including 300 World, International, North American, U.S. and East Coast Premieres. MiamiFF’s special focus on Ibero-American cinema has made the Festival a natural gateway for the discovery of new talent from this diverse territory. The Festival also offers unparalleled educational opportunities to film students and the community at large. Major sponsors of the 2015 Festival include Knight Foundation, Lexus and Miami-Dade County. For more information, visit www.miamifilmfestival.com or call 305-237-FILM (3456).